Yeah I'm right now I'm feeling "too cool to think about school". I'm 14 glorious days into my well deserved summer vacation. Vacation seems like the wrong word though. We have all earned these days---so enjoy them!! Who am I kidding though?----we all still think about school!!! Summer gives me a chance to catch my breath and "think" about the coming school year. Although, I have hit up my favorite spot to gather much needed supplies and ideas for next year. Use #targetteachers and #dollarspot on Instagram to follow more great finds!!! 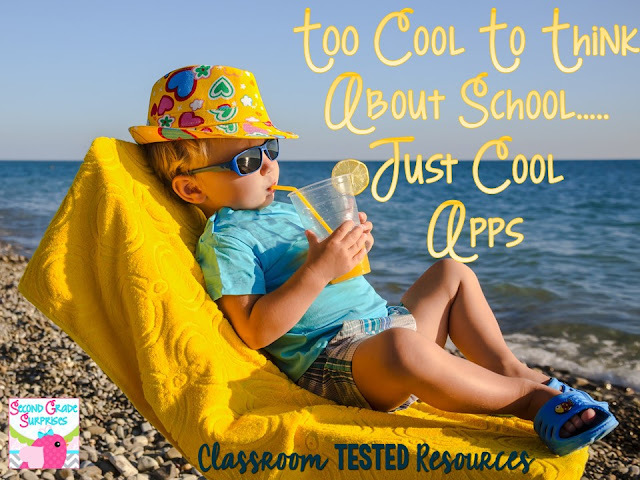 Now onto the cool apps!! I would like to share my favorite apps to use during guided reading and even math!! I personally use all of these apps with my second graders on a daily basis. Our favorites include Reading Eggs, Brain Pop Jr., Math Blaster, and Sumdog. I've put them all on Favorite Ipad Apps link for convenience. On a different note I am getting so excited for TpT Orlando!! Use #tptorlando16 and #findmeattpt on Instagram to follow all the fun! I can't wait to see my CTR friends again this year-missing some others! Comment below if you'll be there too- I'd love to connect with you!